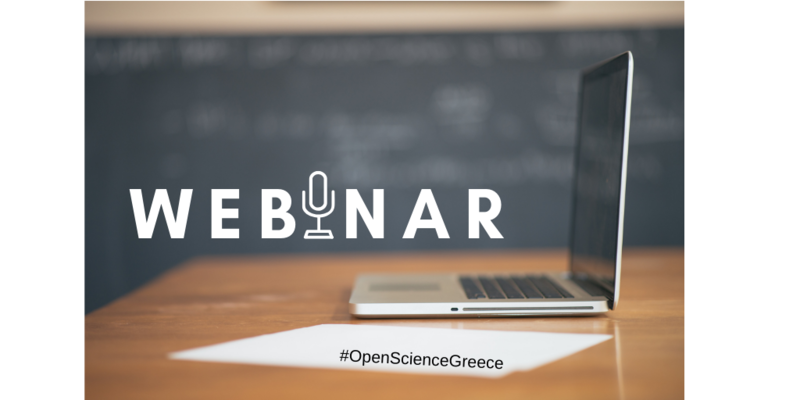 ⏪Flashback: A series of OpenAIRE webinars on vital Open Science issues was initiated last year in collaboration between the Greek and Cypriot NOADs. The specificity of these webinars is that they are conducted in the greek language in an attempt to engage more librarians and researchers with particular aspects of open and responsible research conduct. This activity is expected to, and has actually had already a positive effect, in cultivating change in research culture and in familiarising academic and research communities with Open Science along with setting the right foundations of understanding how compliance with European and national requirements such as the Horizon2020 guidelines and national open access mandates is achieved. ⏺The focus: In response to the academic and research community interests, the focus of this webinar was on research data, its management, planning and documenting activities. Main presenters were Anastasia Ioannou (University of Cyprus Library) and Elli Papadopoulou (Athena Research and Innovation Center in Greece, Greek NOAD coordinator) with assistance of Sylvia Koukounidou (Cypriot NOAD coordinator) who was managing questions in the chat. The webinar took place on Thursday, 21 February and welcomed 93 professionals from diverse scientific backgrounds as well as librarians from the Greek and Cypriot area. Anastasia started the webinar by explaining the Open Science movement following the FOSTER taxonomy to show how Open Science and research data are connected. She then continued with a thorough introduction to research data, to make clear which data are perceived as "research data", what is the format of this data, etc. and to highlight the process and value of managing data and sharing them through Open Access. Of course, data should be open but also FAIR (i.e. Findable, Accessible, Interoperable and Reusable), hence Anastasia gave an overview of the FAIR data principles with examples for each one of them, before handing the floor over to the next speaker. Elli continued the presentation by presenting a timeline of funding programmes in Europe, starting from 2007 and ending with the upcoming Horizon Europe, to show how Open Science has been reflected in the European Research Area throughout the years. She then briefly informed participants about the EOSC (European Open Science Cloud), one of the EC's major recent achievements, and highlighted the current conditions on Open Access and FAIR in Europe. On that note, she pointed out that one of the EC mandates is the submission of a Data Management Plan (DMP), and she devoted time in clarifying basic misconceptions with regards to what is a DMP, when to submit it and when to opt-out, to then conclude with a walk-through the basic components of a DMP. Zenodo for data deposit, Amnesia for data anonymization, OpenDMP for data management planning and linking DMPs with projects and datasets, and the human-centric service of OpenAIRE, its dedicated group of experts, the so-called NOADs (National Open Access Desks). HELIX Data Services and HEAL-Link data repositories (under development) as well as GRNET (generic services) and Elixir-GR or Apollonis (domain-specific services). literature and research data repositories of Lekythos, Ktisis, Gnosis and Kypseli and the National Portal for Open Data. 🔎 The feedback: A feedback form which was later shared with participants showed that, from 19 responses received, nearly 60% is extremely and very satisfied with the content, 36.8% is just satisfied and only 5.3% is slightly satisfied with what has been presented. Moreover, nearly 90% of participants learnt something new by participating to the webinar and all of them are happy to attend another OpenAIRE webinar. 🔜 What is next? The discussions succeeded the presentations as well as the feedback received, highlighted the areas where further support is needed. The General Data Protection Regulation (GDPR) seems to be very present in everyone's scientific agendas, hence it was decided that this should be the topic of the next webinar of the series. Other notable suggestions revolve around domain-specific paradigms of Research Data Management and FAIR data use-cases. Slides and recording can be found here.